Learn to create precious watercolor paintings that you can paint and frame in just one day. Yes, in one day! Paint and Frame: Botanical Painting features 20 charming modern watercolor projects including florals, nature scenes, and more. With step-by-step instructions and watercolor paper included, you can try your hand at these “mini” projects. Then you can instantly display your painting in one of the enclosed frames. Add patterns or colors to your frame, then simply fold it to an upright position. Your brand new watercolor painting can be displayed inside it. Stop storing your art projects in a drawer while you wait to get frames. These handcrafted frames are ideal for displaying artwork around the house, at your desk, or to mail as a lovely handmade gift. 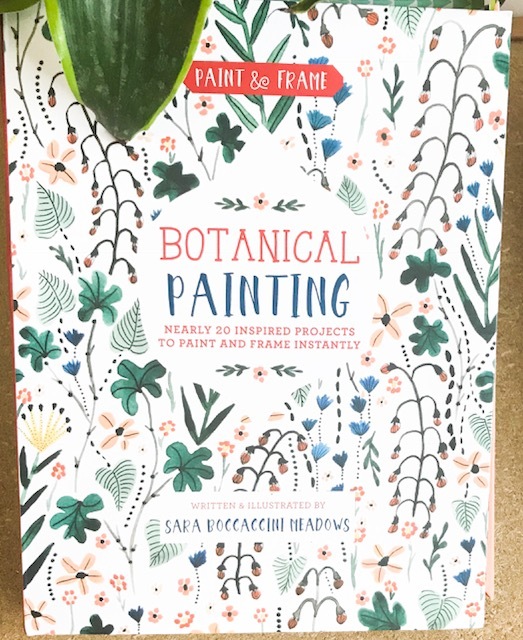 Paint and Frame: Botanical Painting comes with an instruction book, 20 step-by-step watercolor projects to try, an assortment of watercolor paper. Five fantastic 4×6 frames are also included to decorate and personalize yourself. Sara also provides tips on how to make tile patterns for your frames to make your painting really stand out. This is the perfect gift for the beginner artist looking to display their work in an elegant way without paying for expensive frames. A list of recommended tools and color combinations are provided for the beginning artist is also provided to help you get started today. What are some things that inspire you to paint?